Mardi Gras will be here before you know it, and this year, you’re invited to be a part of the fun. You can celebrate by enjoying authentic New Orleans cuisine at Lincoln, Nebraska’s favorite Cajun food restaurant. Buzzard Billy’s offers a diverse and delicious menu, as well as a welcoming atmosphere and friendly staff. Locals and visitors alike love to celebrate Fat Tuesday with their authentic Cajun dishes and drinks. Tuesday, March 5, 2019, 11 a.m. to 11 p.m. This top-quality restaurant is ringing in Mardi Gras with fantastic food, delicious drinks, and lots of fun. 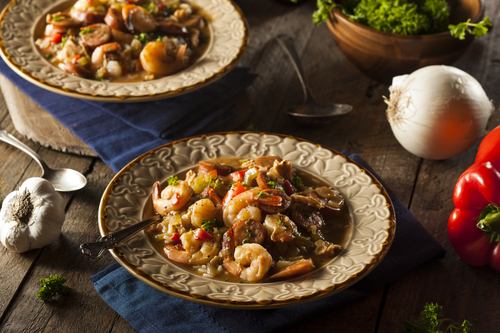 Guests will enjoy classic New Orleans dishes like jambalaya, gumbo, and etouffee. And if you’re feeling adventurous, you can also try their house specialty: gator fingers. Their full menu will also be available, featuring favorites like Burnt Ends Po’ Boy, Mardi Gras pasta, New Orleans Steaks & Shrimp, and the Cajun Cowboy burger. Grab a cold beer or hurricane from their full bar, and celebrate Mardis Gras in style with all your friends. They will offer specials on hurricanes and Louisiana beers all day on Fat Tuesday! Not to mention each table will receive a mini King Cake, which means if you find a baby in your cake your meal is free! *Alcohol and gratuity not included. Buzzard Billy’s is bringing Bourbon Street right to the haymarket with prizes and beads galore! *hours may vary on home Husker Football game days.